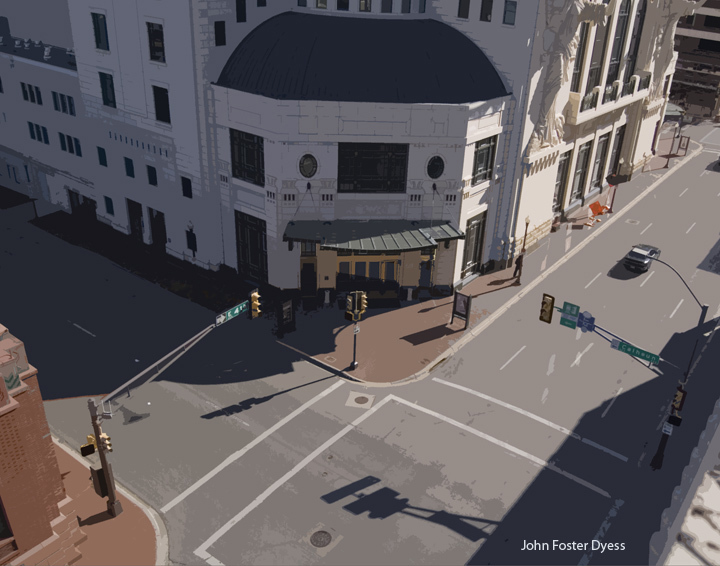 This final Fort Worth image, is a poster my wife and I designed, that could be used to promote the Bass Performance Hall in Fort Worth,Texas. 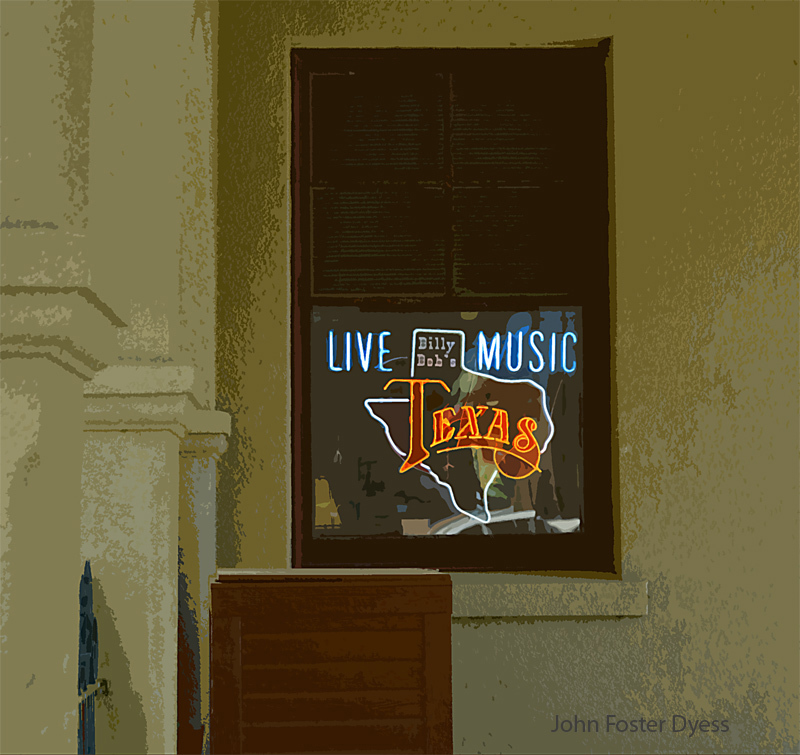 I created the image which was based on a photograph that I took while visiting Fort Worth in 2008. My wife created the design and selected the type. 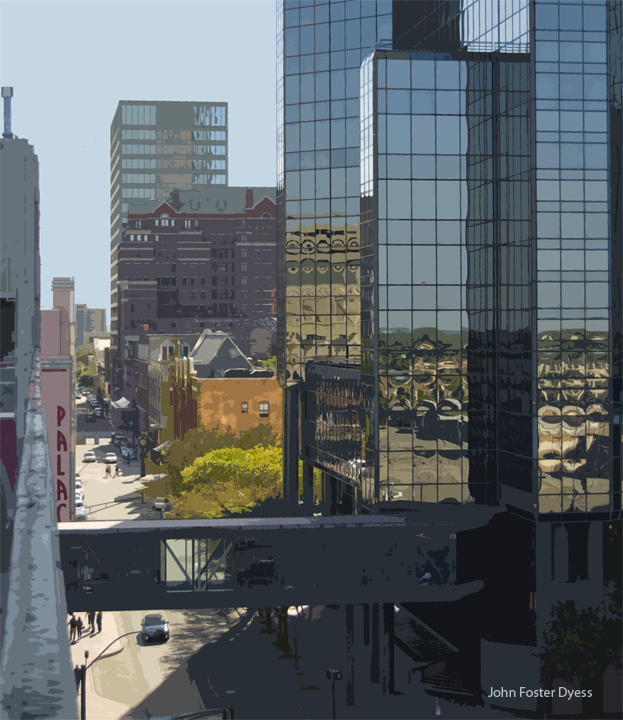 My digital art is based on a photograph that I took from the roof of a garage of the Bass Performance Hall in Fort Worth ,Texas. The woman pushing another woman in a wheel chair was moved to the left, closer to the building, than it was in the photo. I wanted to make a visual connection of the woman in the wheel chair to the angels. It begins with a digital photograph. I shoot what I find visually stimulating and exciting. This is not only the item itself, such as a building, street, motorcycle or signage, but — the abstract shapes, colors and nuances found within the surface and contours of the subject matter. I could be shooting from inside a moving car, from an office window looking out, from the top level of a parking garage or walking on street level. 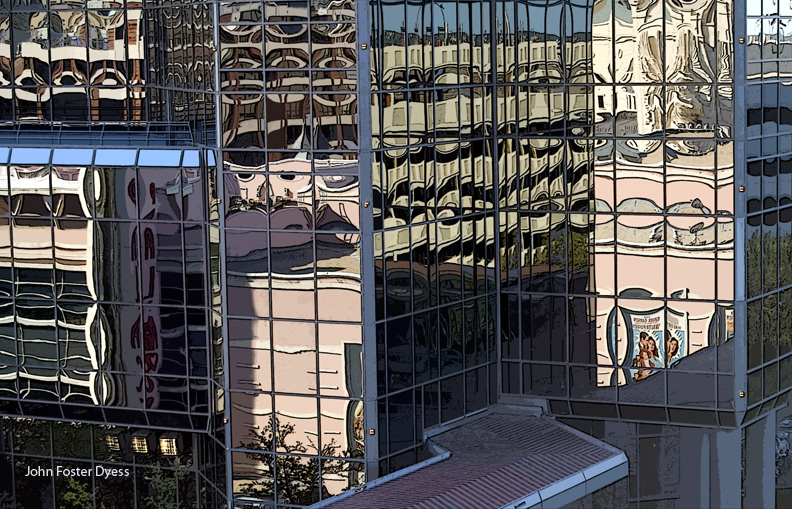 When shooting in familiar places such as my home town, St.Louis, I find there is such a personal association in my conscious mind with the buildings and structures that I am distracted somewhat from finding those true abstractions of shape and shadow in form that seem to reveal themselves in this Fort Worth series. Back in the studio I focus on the design quality of the photograph. I might intensify or mute certain colors or manipulate the nature of shapes, texture or shadow. I consider the final image one rendered as mixed media. Finally the image is printed on a paper surface and a paper size that best expresses my creative vision. I have a long career as an illustrator and painter and I am always looking for a new process or creative outlet. I continue to combine traditional methods and digital methods in a symbiotic approach to enhance the final piece of work . “Stockyards cowboy” is another of my digital paintings, based on photographs that I took while visiting Fort Worth, Texas in 2008. My focus was on the black shapes created by shadows on the wooden fences. 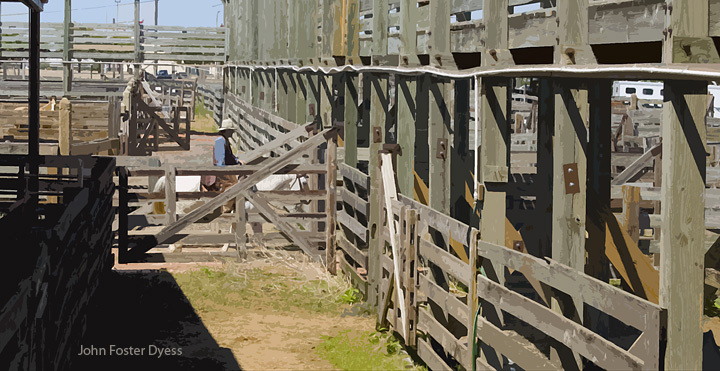 This digital painting was based on a photograph that I took while visiting the Stock Yards in Fort Worth,Texas. The name that I gave to this painting seemed appropriate because the motorcycles parked on the street are the horses of the twenty first centuary. In April of 2008,while visiting our friends,Reverend Tim Carson and his wife Kathy,my wife and I were treated to a tour of the city and the well known stock yards.As usual,I began taking numerous photographs of our varied surroundings,fascinated with street scenes and the city’s architectural landscape. As I viewed the photos on my computer,after coming back to St. Louis,I became aware of details,subtleties,colors and shapes I hadn’t particularly noticed through the viewfinder. This was the creative spark,the genesis,for beginning a new body of work,some of the results of which are below.